As a wardrobe stylist, I meet new people all the time, whether it’s in consultations with new clients, socializing at my events or networking with other entrepreneurs. And among the most common questions I’m asked are ones about color. “What color is best for my skin tone?” “Can I wear this color with that one?” “Which colors will make me look slimmer?” And when I talk to people about color, I hear a lot of general misconceptions around which shades work together, how to use colors to flatter your face and body, etc. So, I’ve compiled a handful of common color myths (aka the ones my clients ask about most) and the real truths that you need to know. MYTH: Navy and black don’t go together. TRUTH: Navy and black were made for each other. This is THE most common color question I get – seriously, about 1 out of 4 clients ask! And my response is this: you wear dark blue jeans with a black top, right? Then you’re already wearing navy and black. Navy and black are an easy, no-brainer, sophisticated combo - they’re two dark neutrals that work with multitudes of colors separately and together. And when paired, they tame the seriousness of an all-black look, while making you look a bit more style savvy. The secret is doing this purposefully (as opposed to looking like you got dressed in the dark). Pick one color to be the focus and the other to be the accent – such as a navy dress with black boots or a black top and pants with a navy jacket. And with these outfits, I love echoing a little black in your accessories – like with a black and white color block bag or a hint of black in your jewelry. MYTH: No white pants (or shoes) between Labor Day and Memorial Day. TRUTH: White pants and shoes are year-round options. This one is a truly antiquated rule, with vague origins. Some say that it was practical – white was saved for summer heat, since it’s (physically) cooler. And others say it was a sign of the wealthy, since they didn’t do ‘dirty work’. Either way, it’s time to let this one go! Weather-appropriateness is more about fabric weight than color – the only caveat being that you’ll probably want to avoid white pants and shoes in inclement weather simply because they’ll get dirty. I love white jeans, especially in winter as an uncommon outfitting option. They create cozy looks paired with pale neutrals and also add life to dark colors. Click here for some tips on wearing white jeans in cold weather, with a few fun outfit ideas, too! MYTH: Blue and green shouldn’t be seen. TRUTH: Blue and green are best friends. I had never heard this one until a year ago, when a client repeated it to me. Apparently, the actual saying goes, “blue and green shouldn’t be seen unless there’s a color in between.” News to me! Blue and green are next to each other on the color wheel, which means that they’re friendly hues, destined to be worn together. They create a (literal and figurative) cool combination, one that I wear quite often. And I love taking color inspiration from nature – what’s more natural than pairing green leaves with a blue sky? MYTH: Black is the most slimming color – it hides everything! TRUTH: Other dark colors are just as slimming. ‘Slimming’ clothes are more about fit than color. Other dark colors, like navy and charcoal, are just as slimming and much more versatile. Black can be harsh (especially on fair skin tones), while other dark shades are infinitely more flattering. All blacks don’t match – so in daylight, you’ll notice you’re wearing three different shades of black at the same time. If you’re looking to slim your figure visually, read this for tips on wearing ‘columns of color’, along with other ideas on dressing to flatter your proportions. MYTH: You can’t wear brown and black at the same time. TRUTH: You can if you want to. 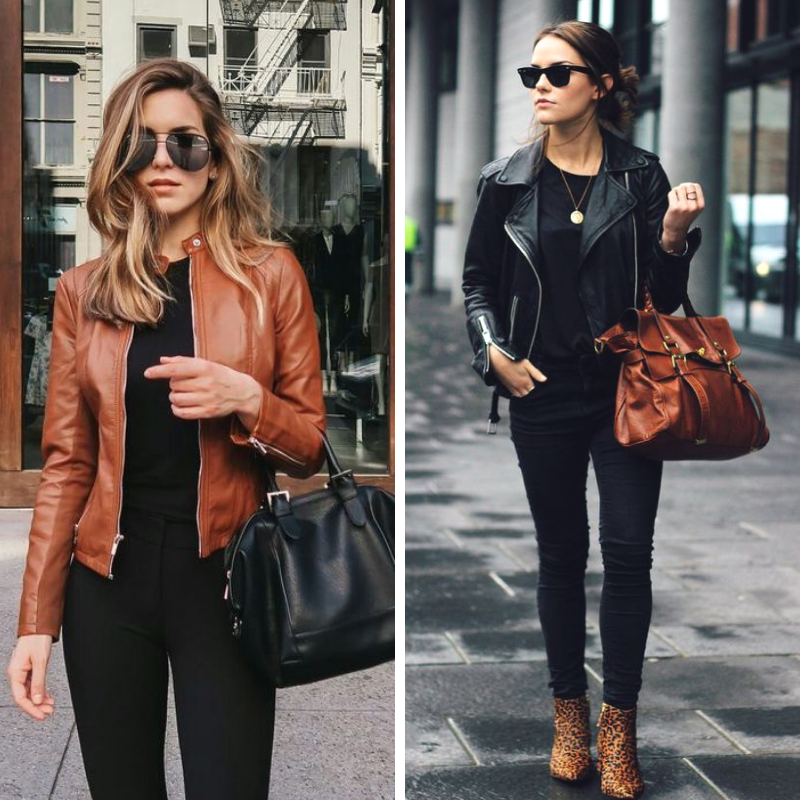 Just like black and navy, brown and black are two neutrals that work great together – hence, the definition of ‘neutral’. My favorite way to wear this duo is a black outfit with brown accessories as something totally out of the norm, but with tons more depth than black with black accessories. And since there are so many shades of brown to choose from (chocolate, cocoa, chestnut, tobacco, butterscotch), you can really have fun with this combo. If you need more permission to wear brown and black together, link the colors with a print that contains both, like a leopard print scarf or tortoise jewelry. And then check out how else to use ‘blueprint’ prints to coordinate your outfits in this blog article. MYTH: You should only wear colors that flatter your skin tone. TRUTH: Place colors that flatter your face near your face. Yes, there are colors that truly complement the shade of your skin – hues that make your eyes sparkle and make your face look radiant. But every once in a while I meet a client who has had her ‘colors done’ (a color expert has determined her most flattering tones) and she thinks that those are the only colors she can wear. So not true! Those are the colors that are best to wear next to your face, but as far as everywhere else, you can wear any color you like. So if yellow is your favorite (but it makes you look sallow), find some yellow pants. If pink is your passion (but pink tops bring out ruddiness in your skin), try a cute pair of pink heels. And if you love kelly green (but your face doesn’t), how about a cool green bag? For more tips on wearing colors that may not flatter your skin tone (along with favorite fall/winter color pairings), click here. Are you ready to bust some color myths with your outfits? When you do, send me a photo – I’d love to see!